There are over 300 species of Dianthus, and hundreds more of hybrid varieties. The group includes annuals, biennials and perennials. Most Dianthus produce richly fragrant flowers in the spring or summer, sometimes extending right up until the first frost. 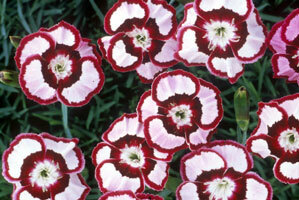 Although Dianthus species vary from 2 inches to 3 feet tall in height, most garden varieties are 10 to 20 inches tall. 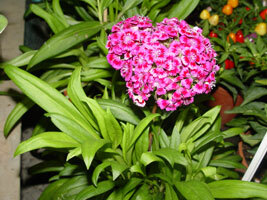 Dianthus should be planted where they will receive at least 4-5 hours of full sun each day. They thrive in fertile, fast draining, slightly alkaline (pH 6.75) soil. Avoid over-watering because it may tend to turn the foliage yellow. Usually a weekly watering of established plants will suffice unless the weather is extremely dry. 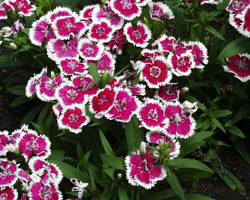 Dianthus will often reseed themselves, so don't be too hasty in removing spent plants from the ground. Perennial varieties may be propagated by tip cuttings, layering or division. Spent flowers should be removed promptly to promote continued blooming. Plant Dianthus species 12 to 18 inches apart and at the same depth at which they were previously growing. The crown, or top of the root structure, must be level with the surface of the soil. (Never bury any part of the stems.) Unlike most other plants, Dianthus plants should not be mulched. They require good air circulation around the stems at all times and must be kept as free from foliage moisture as possible. For continued blooming feed lightly every 6 to 8 weeks with an all-purpose (10-10-10) liquid fertilizer. New plants can be started from seeds sown in spring or early summer directly into the garden. Sow the seeds 1/8 inch deep in light well-drained soil in a sunny location in the garden. Firm soil over seed and keep it moist until the plants are sprouted and growing. These plants will probably not flower until the following year. You can also start Dianthus seeds indoors 6 to 8 weeks before the last frost is expected for spring planting and same year blooms. Softwood stem cuttings taken in the spring or in early summer will be ready to be planted in the garden, in the fall. These plants will not flower until the following year. Dianthus are also easily increased by division. This method has the additional benefit of rejuvenating older, non productive clumps. Dig up an entire clump, and either pull it apart using your hands to seperate the plant segments, or use two gardening forks inserted in the center of the clump, to gently pry the plant apart. Replant each new division as you would a new perennial or annual, and water it in very well.